The humanitarian cavalry is the food airdrop: when you need to shift serious tonnage in a hurry to somewhere inaccessible, nothing quite does it like a large cargo plane and skilled pilot and crew. 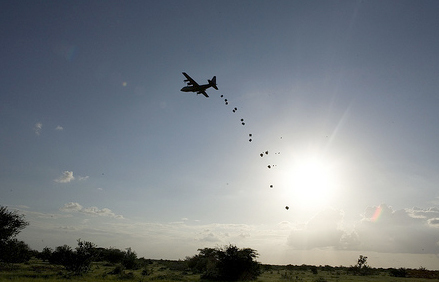 According to the World Food Programme (WFP), air drops have delivered 1.5 million tons of aid in the world's worst emergencies over the past 15 years. In its busiest operation, in south Sudan, 2.5 million people in need were reached between 1990 and 2005. It's an expensive enterprise, and these days humanitarian agencies prefer to build roads to reach the vulnerable. Road construction and repair in southern Sudan has made overland delivery roughly 50 percent cheaper than by air. But roads can be washed away in heavy rains, or closed by conflict; in the northeastern Democratic Republic of Congo, airdrops are the only practical way to supply 130,000 people displaced by fighting around Dungu. The last convoy of trucks to reach the town from Uganda took 35 days to drive a distance of 520kms - compared to less than two hours by plane. So, how do you do an airdrop? There are basically three types of aircraft that do the job: the Antonov-12 (hauling about 15 tons), the Hercules C-130 (18 tons), and the Iluyshin-76 (36 tons). The choice of aircraft is down to the operator hired by the humanitarian agency, but all must be specially equipped and certified. They are big and thirsty, and need a ground crew of two or three engineers, plus a project manager, to keep flying safely. If you've got a forklift, loading can be as quick as 15 minutes; for the monster Iluyshin, it's about 45 minutes. Air missions usually last between two and four hours, covering distances of between 200kms to 600kms. At the height of the southern Sudan operation, daily sorties were being flown from Nairobi and Lokichokio in Kenya, as well as Khartoum and El Obeid in Sudan. Usually it's only food powder, pulses or grain that is dropped - 50kg per bag. There is nothing special about how the food is readied before loading except it's triple packed into three 90kg sacks, which are then stitched together. According to WFP, four electric sewing machines should be able to handle 5,000 sacks a day. The reinforced bags survive most drops; the wastage rate is a tiny 2 percent. In the past plywood pallets also exited the plane, coming in handy as construction material or firewood for people on the ground. But it increased the cost of airdropping, and their uncertain trajectory also made them a bit dangerous. New dropping techniques means just the food falls. Rocks, swamps, people - or roaming livestock - make for a bad DZ. Choosing the drop zone is the responsibility of the ground controllers, typically a radio-equipped food monitor and/or logistics officer. They mark out the DZ, ensure security, communicate with the aircraft, and work with the local relief committee to gather the dropped food aid and organise distribution. The size of the DZ depends on the type of aircraft making the drop, but generally it's 200 meters by 1,000 meters, marked out by white food bags, with a cross dead centre. 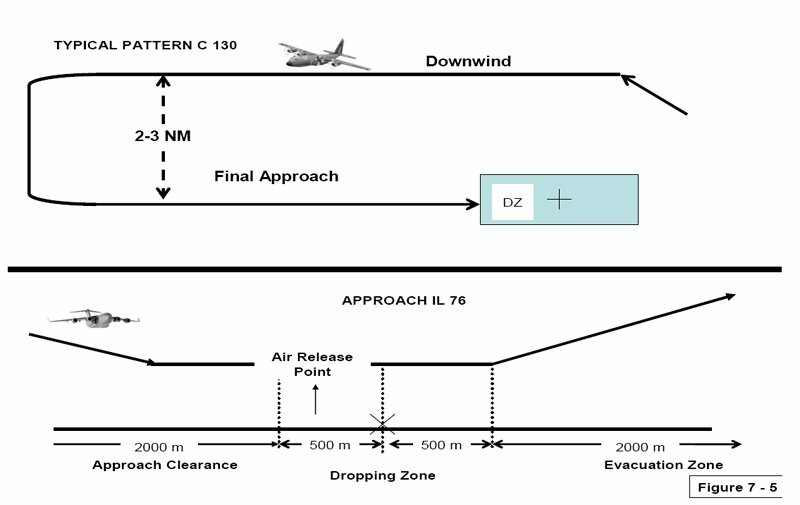 The area is secured - with a 200 meter perimeter outside the DZ - at least one hour before the scheduled drop, and it's the ground controller who clears the aircraft to release its cargo. Airdropping is specialised, it's normally only former military pilots that have the training. They generally drop from just over 200 metres above the ground to reduce impact on the bags. Two loadmasters supervise the cargo, and release on the pilot's command. The dropping system used is down to the operator, with the cargo arranged in either a single or double row configuration; if it's single row, it exits the plane all in one go. On final approach to the DZ, the pilot keeps the plane's speed down to around 185kph, and lifts the nose by 8 to 10 degrees; when the loadmasters releases the bands holding the food in place, gravity takes over and the bags tumble to the ground. "Once the drop is finished, you lower the nose, give some power and close the ramp at the back," former navigator on a C-130, Philippe Martou, told IRIN. "You do a low pass to have a look at the DZ, to see if possible, whether you can drop better next time."